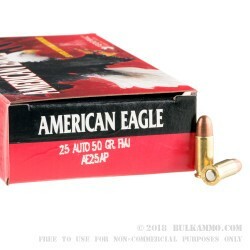 For the shooters of .25 ACP it’s a great choice to shoot the clean, reliable and consistent rounds offered by the American Eagle line of ammunition – a Federal Ammunition brand line. 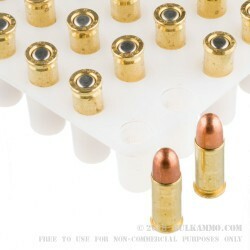 This ammo just does its job without a bunch of fanfare or difficulty. Yes this is not the hottest round in the world, but it’s also a .25ACP, which does not have the reputation as being one of the hottest loads in the world. 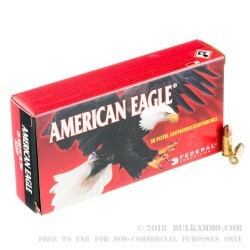 What this is, is a good basic ammunition for the .25 ACP, a perfectly respectable backup weapon caliber and a very tame, mildly recoiling cartridge that can be counted on to be reliable in ignition, functionality and extraction. Regardless of the firearm chosen for firing this ammunition it is a very reliable option, working in most mainstream firearms chambered for the .25 Auto over the course of the last 70 years or so. The low powder charge and mild round makeup makes this ammunition safe for test firing or target practice for older guns that are in good working order but might be quite old and therefore need to be proven safe. 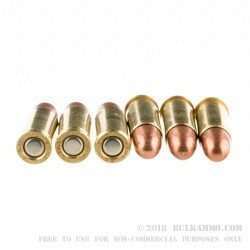 Aside from the general range and target duties, this round could easily be used as a self defense cartridge, though, the lack of a hollow point and the baseline speed means it was not necessarily custom designed for that purpose.